Spontaneous sightseeing is what we’re all about. When we drive along Europe’s back roads with our guests, and when we see something interesting, we check it out. Big Bus Companies are all about staying on a schedule. They have to, with 40 people, even a potty stop has to be coordinated. The other day, Jim was driving through Austria with his Micro-Group Tour of just five people and he spotted a cable car. The weather was perfect. “Want to take a ride?” The response from three of the five, “Sure!” The two who didn’t really care for heights stayed below and enjoyed the view from ground level, along with a beer. We took the cable car up and back, a round-trip of less than 40 minutes but one that yielded terrific photographs and a memory to last a lifetime. Try that on a Globus or Trafalgar budget bus tour – I don’t think so! 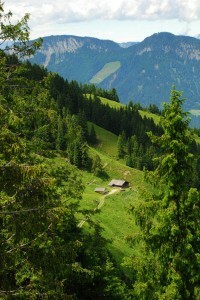 Posted in Austria Tours, New Discoveries, Postcards from Europe and tagged austria, cable, car. Ah, yes. Those little extras like the stop to take the tram up the mountain on a beautiful clear day in Austria. That is what I like about these tours. You have an itinerary of places to see but then all of a sudden when part of the group wants to take the river boat on the Rhine but Jim wants to try to get to a castle ruin, you end up on a narrow road in a steep vineyard with a beautiful view of the river and boats sailing up and down. All of a sudden you are sitting on a bench enjoying a view that you would never see on a regular megatour. I will never forget that trip. In fact, there we are – right at the top of this website with the changing views.